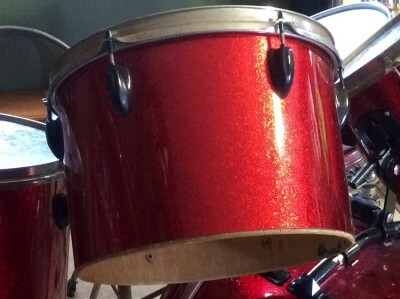 Pictures sent in (June 2014) by Derek Rodriguez from Las Vegas, Nevada of his drum set. Beautiful job Derek! 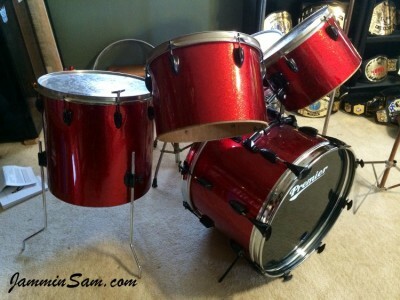 This kit was my dad’s that he got in the sixties. From what I can tell its a Japanese kit but no other info on it. Because of his health, it was sitting in his garage for years rusting and falling into a sad state of disrepair. When he passed away this past January my mom offered it to me, and since my young kids love going to guitar center and beating on their drums I though it fitting to bring them home and try my best to restore them. After checking other sites who sell drum wrap, I just loved the presentation and quality assurance people have put forth about Jammin Sam’s wraps, not to mention the price point was great. And I made the right decision. This wrap is incredible, and was very easy to install. the pictures do not do the wrap justice but rest assured, that the JS Red Sparkle is awesome. I still have a lot to do to them (some new rims for the rack toms and floor toms, and some wrap for the snare) but I know, where ever Raymond Rodriguez is, he is looking down and is pretty impressed how his 40+ year old kit looks. 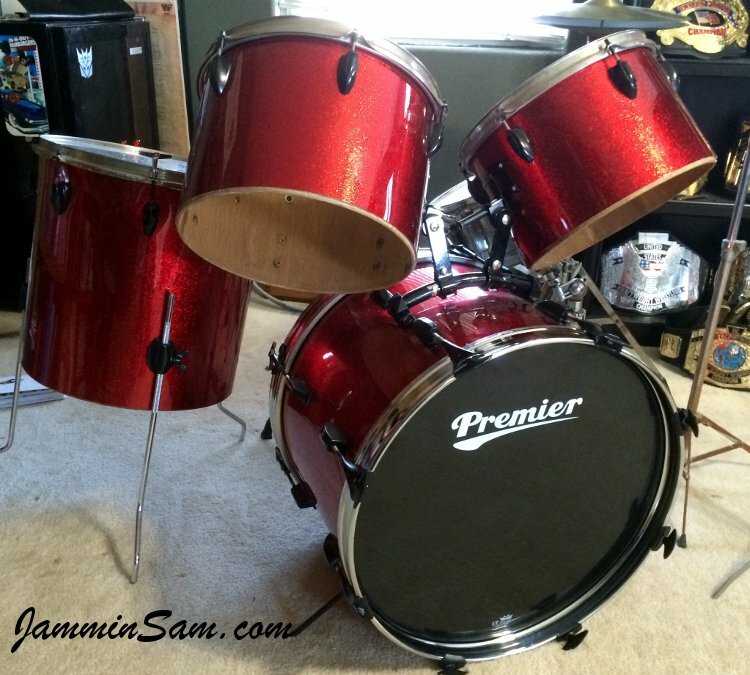 Thank you Jammin Sam, you brought these bad boys back to life and my dad’s memory will live on through this kit.